Last winter started out with big rains in December, and we thought we were in for a doozy of a wet winter. But just as quickly as the floodgates opened, they slammed shut, and we had an incredibly dry first part of 2013. We were all happy to have an early, warm spring to enjoy—but the vines took off quite early, and behind the scenes we were all waiting for a cold snap to come in and turn our smiles to frowns as frost hit the vines. That expectation also went unmet, thankfully. I didn't hear of a single vineyard that had any frost damage, which—considering that we took off out of the gate about three weeks early—is pretty remarkable. The warm spring led to a very warm early summer, which we're gliding through right now. We’re seeing color in the Russian River Pinot blocks well ahead of average. 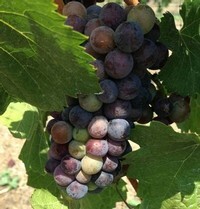 This color change is called veraison, and is an indication that the grapes are switching their focus from growth to ripening. There’s no foolproof way to predict harvest dates, but we typically pick about six weeks after veraison. If the warm temps stick around, we could be picking pinot noir in August! Gulp. Actually, I'm certain that we'll be picking grapes in August, because we plan to make our first sparkling wine this year and those grapes are picked much earlier than the grapes for still wine. At this point, we're crossing our fingers that we get some cool weather to give the grapes a little hang time—and we’re also making sure that we've got everything ready to go, just in case. If you’re interested in updates on our vineyards, please Like our Facebook page, where I post frequent updates on the various vineyards.